Sauerkraut -This is a video I have wanted to do for a long time – It’s so tasty and so good for you too. Begin by cutting your cabbage into quarters and removing the stalk. 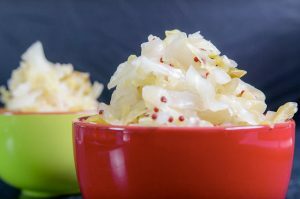 Shred or slice your cabbage up into the size that you like, this can be either fine or more coarse. Add each quarter of cabbage when sliced, into a large bowl and mix in a quarter of the salt. Now get your hands in there and massage the cabbage to mix the salt through. Continue to slice, mix and massage each quarter of cabbage and salt until you have all the cabbage in the bowl. Time to add the other ingredients to add the flavouring to your sauerkraut. Mix through, cover and leave for 1-1.5 hours. After a while you will notice all the liquid that has started to leach out of the cabbage and the cabbage is glistening. 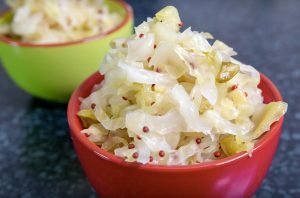 Now you pop your sauerkraut into the jar that you are going to use to ferment it in. Push it down firmly so try and not leave too many big air pockets. Make sure all the cabbage is under the liquid and use a weight to keep it submerged. I used a small ziplock bag filled with water to weight my cabbage down. You don’t want to tightly close your jar so just close it loosely and cover with a clean kitchen towel and place in a cool dark place for 3 weeks to ferment. Have you done the second video on your “stored Starter?” Reviving the Starter? I’m looking forward to it! I hope all is well and thanks for all you do!